When we first starting talking about creating Numenera Destiny and Numenera Discovery, we agreed that we wouldn’t make these new corebooks unless we could find a way to make them backwards compatible with Numenera supplements. We didn’t want players to have to buy new versions of books that they already owned. Mostly, making the new corebooks work smoothly with the existing supplements was easy. There were no changes that affected how the core game rules worked. Everything fits together seamlessly—and you can even use both the original corebook and the new corebooks at the table together without a problem. Oddly, what gave us the most trouble was one of our favorite parts of our books: corebook callouts. If you’re not familiar with the term, callouts are the references that we add to our books, along the edges of the pages. They include quotes, worldbuilding notes, additional information, and reference page numbers. Corebook callouts are page number references in supplements that lead back to the original Numenera corebook. 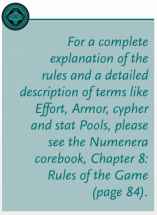 For example, you might find a corebook callout in The Ninth World Bestiary for Effort that leads you to a page in the Numenera corebook, where you get an explanation for the concept. The problem is: we knew that the new corebook would change enough that those page numbers would no longer be valid. Callouts are a design choice that Monte started using way back when he wrote Ptolus, and when we started working on Numenera, we knew we wanted to include them. Since then, we’ve added them to every book, and heard lots of players and GMs tell us how useful they are. They’re a lot of work, but they’re a vital part of our mission to make gaming easier and more fun, by putting what you need at your fingertips. So we knew we couldn’t do without them. We batted around a bunch of possible solutions. Stickers came up (to place over the incorrect page numbers in supplements), but obviously that created more problems than it fixed—PDFs, for one. And then the original corebook pages were no longer accessible (unless you peeled up the sticker each time). Not to mention cost, time, and, well, we all love stickers, but not that much. We talked about trying to keep Numenera Discovery the same layout as the original corebook, so the page numbers would be the same. But right away we saw that wasn’t an option—there’s so much cool new art in Discovery, and we wanted to improve the layout, not force it to fit into something that already existed. 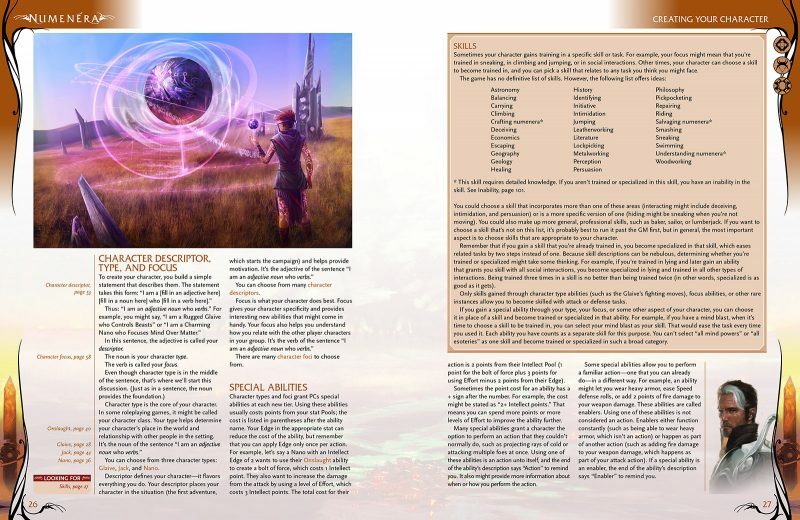 Finally, we found a solution that let us do everything we wanted: page callouts in supplements would be useful no matter which corebook you were using, there was minimal extra work on the reader’s part, and it let us make Numenera Discovery as beautiful as it needed to be. The solution (which seems so simple now that we’ve finished it) is Looking For. then you can pick up your original corebook and flip to page 26 and find the reference for skills. Or you can pick up your copy of Numenera Discovery, flip to page 26 and read the Looking For, and then scan to the next page to find what you need. Catch more sneak peeks of Numenera Discovery and Numenera Destiny by subscribing to our website! We’ll be posting Numenera Design Diaries from the Monte, Bruce, Shanna, and Sean weekly for the next few months. You won’t want to miss these first looks at new character options, rules for building and supporting communities, and much more! 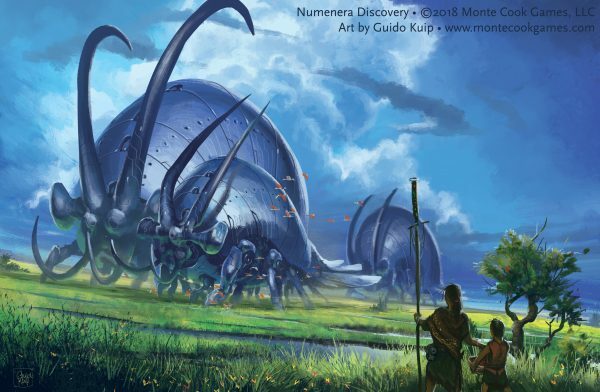 Preorder Numenera Discovery and Numenera Destiny and get the PDFs free!